Help Chicago Zoo Track Animals! 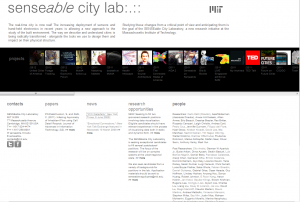 Here’s a bit of city/data news, from CityLab, that you (and I) can actually help with. The Urban Wildlife Institute at the Lincoln Park Zoo has created an interactive website, Chicago Wildlife Watch, “to help the Institute document and study the animals that live in Chicagoland” by viewing photos taken from cameras around the city and tagging which animals are in them. According to the Institute’s director Seth Magle, who spoke to Chicago’sRedEye last week, this work used to fall under the purview of interns. As the Institute ramped up its identification efforts, the onslaught of photos—they currently have more than a million—became too much for their team to handle, so they decided to crowdsource. To date, more than 91,000 animals have been identified through Chicago Wildlife Watch. I played around with the website, and there seems to be a lot of squirrels, and sometimes nothing, but that just makes it more exciting to find a deer or skunk. My friend Shahrzad Rizvi, along with co-author Joshua Kelly, recently published an article in Public Management Magazine titled “Communicating Emergency Information on a Budget.” The article covers low-cost ways for emergency managers to connect with their communities. It highlights social media, new types of alert systems, and free online mapping of public safety concerns. The article includes links to some of these new tools, so I encourage you to check it out. Jon Stewart took on MERS on Tuesday night’s episode of the Daily Show; watch it below. As I’ve noted in earlier posts, there is a good deal of recent ongoing litigation against MERS, and it’s not only in the mortgage-registration business; it also markets tools to local governments for vacant property registration. Today I’m spotlighting a few websites that track real-time health information. Another new website, sickweat her.com, is focused on collecting information from social networks. Users can (1) input their health symptoms or (2) let sickweather’s algorithm crawl their Facebook and Twitter feeds for reports of illiness. Then, that data is used to show where in the US certain symptoms are cropping up most often. As reported in Fast Company, it’s named “sickweather” because, “just as Doppler radar scans the skies for indicators of bad weather, Sickweather scans social networks for indicators of illness.” Yet as John Metcalfe at Atlantic Cities points out, it looks like some cities have a bulk of the users so far, so until it catches on, it’s more just for fun. And since it relies on user self-reports and has no fact-checker, it may be less accurate than healthmap, which relies on articles that have are vetted in some way. Sickweather, however. has the potential to catch outbreaks much earlier in their lifecycle than healthmap; it’d be great if the two services could be integrated. 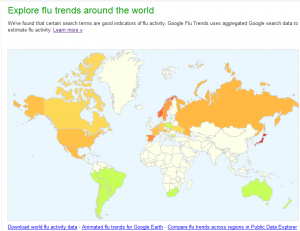 One final project that has the potential to catch diseases early on is Google’s Flu Trends, which uses search terms that, Google says, “are good indicators of flu activity” to provide a visualization of which countries have the worst flu activity. Google also has a tool for tracking Dengue fever. These technologies are an important leap forward. 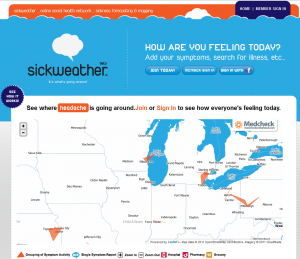 And the more people who know about it, the better the technology gets, at least in regard to sickweather.com. So, check it out. Here’s an inspiring video that showcases a teacher in Detroit who is coaching low-income kids from Malcolm X Acadamy competing in a regional Future City competition for city planning. They win the rookie prize. I think that teaching kids this form of civic engagement is vital to our future. 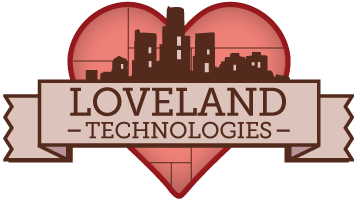 LOVELAND Technologies is a neat project out of Detroit, Michigan, that is selling micro-lots of land in “microhoods” for $1 per square inch that people can track online. They focus on making these microhoods exciting by generating artsy urban-renewal projects. According to their website, they “aim to provide a fun, game-like ownership experience while creating entertainment fundraising, community collaboration, and social mapping tools that work at any scale.” They got started a few years ago through Kickstarter. They have a few other projects. There’s online mapping projects (in collaboration with Data Driven Detroit) and a “LoveTax” system, a creative way for people to fund projects. They also have a cool online app called “Why Don’t We Own This?” that tracks more than 40,000 vacant properties owned by the city, state, or county. The Huffington Post recently reported that this year’s Code for America fellows in Detroit will be building off the momentum that project has created. Overall, a great Detroit project to check out. For more info, the founders gave a presentation at a TEDx conference in Detroit in 2010 that I’ve embedded after the jump.